Broken Truce: The Finished Cover!!! - Romance, Adventure And Random Moments. Broken Truce: The Finished Cover!!! So here it is at last!!! 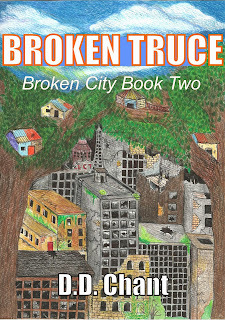 The cover for the next book in my Broken City series: Broken Truce!!! Broken Truce has taken me by surprise, I think it's quite different from the first book in the series; not so hopeful, a bit darker and you see the City from more peoples points of view. Deeta has grown up a lot, and she's wiser than before. I had a blast with some of the secondary characters this time round as well, the first story is quite insular, focused the the group of people that Deeta loves and cares about most. Broken Truce introduces you to a lot of new characters, some good and some bad. These side characters were some of my favourites to write; Ian, a scout from the Brownly tribe, Julian, Max, Ned and Linus, I can't really tell you who these are without being too spoilerish, but they were sooooo much fun! Wren, Falcon, Raven and Kestral, siblings from a tribe known as The Birds, and so much more!